This week Rich and I are joined by Mike Seeklander to discuss the process of selecting one’s first handgun, Justin disses Colorado, and if you stick around to the end you get to hear Rich and Justin rant about…well, you’ll have to find out for yourself. Mike Seeklander is a former U.S. Marine and combat veteran. He is a former sheriff’s deputy, Federal Air Marshal, lead instructor for the Federal Air Marshal firearms training program. Mike is a national champion in IDPA and professional, sponsored training. He is also the host of the American Warrior Show. Also be sure to check out Mike’s site, Shooting-Performance. Today he talks with us about selecting handguns. See Mike’s Appearance on Civilian Carry Radio where he talks about his beginning with handguns. Handguns are portable. They are small and lightweight and can be carried hands-free. Handguns are the weapon your are most likely to have if you need to defend yourself. Single Action: Single action (SA) means that the pistol’s hammer must be cocked prior to pulling the trigger. 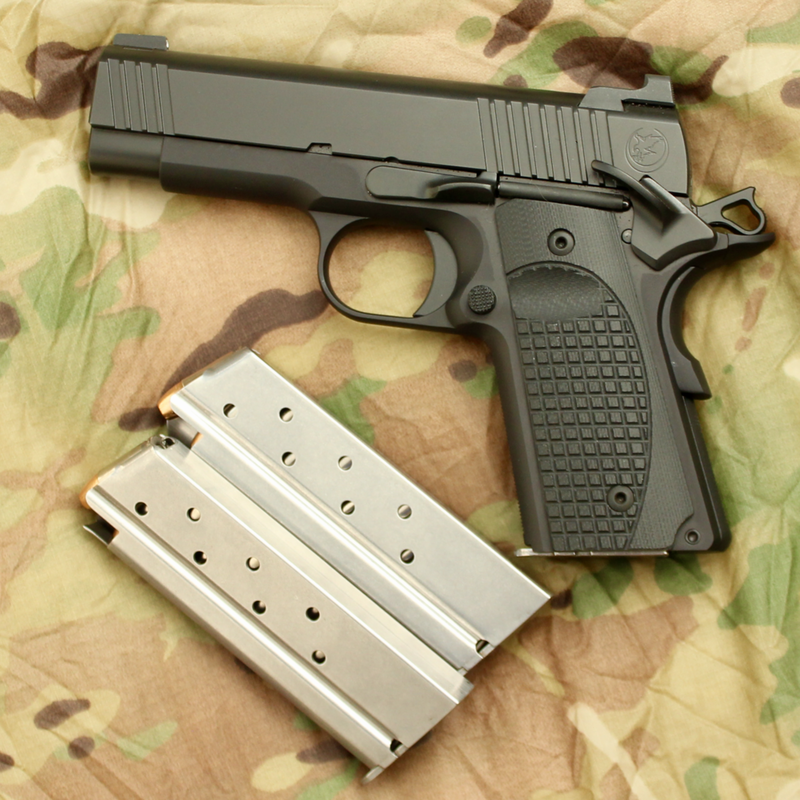 The 1911 pictured below is a single-action pistol. Double Action: Double action (DA) means that one can pull the gun’s trigger without first cocking the hammer. The trigger accomplishes two actions: pulling the hammer back, and releasing it. The revolver and pistol pictured below are both double action handguns. Some handguns are double action only, meaning they can only operate in double action. Both of the guns below also be used in single action mode, which provides, a shorter, lighter trigger pull. 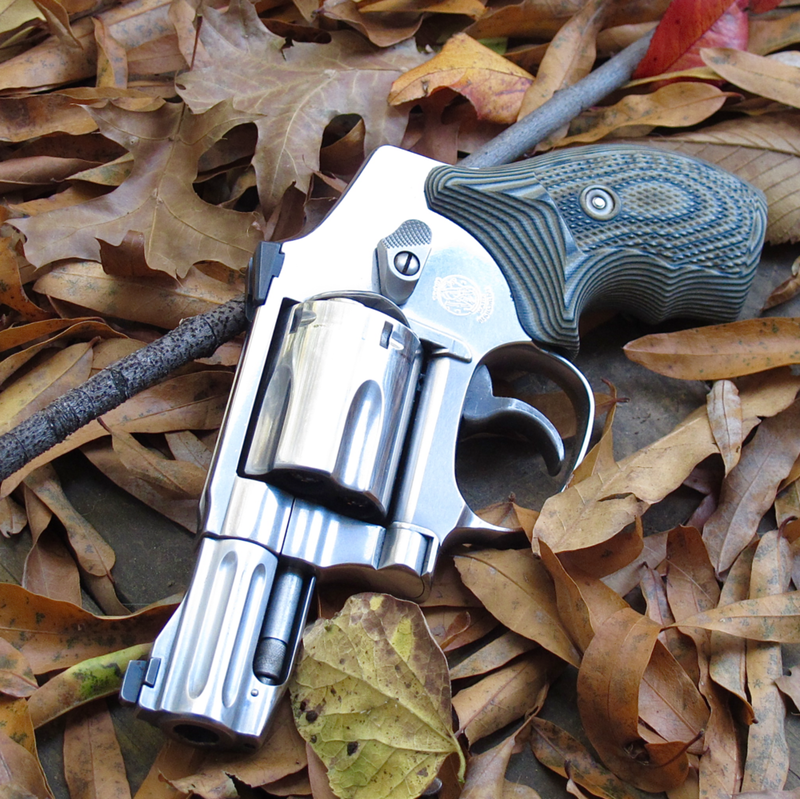 Striker Fired: This is one of the most common types of handguns seen today. The striker fired mechanism has been popularized by Glock, the Smith & Wesson M&P series, and others. Striker fired handguns do not have a hammer, but rather a spring-loaded striker that is partially “cocked” when the gun is at rest. This results in a very short, consistent trigger pull for every shot. 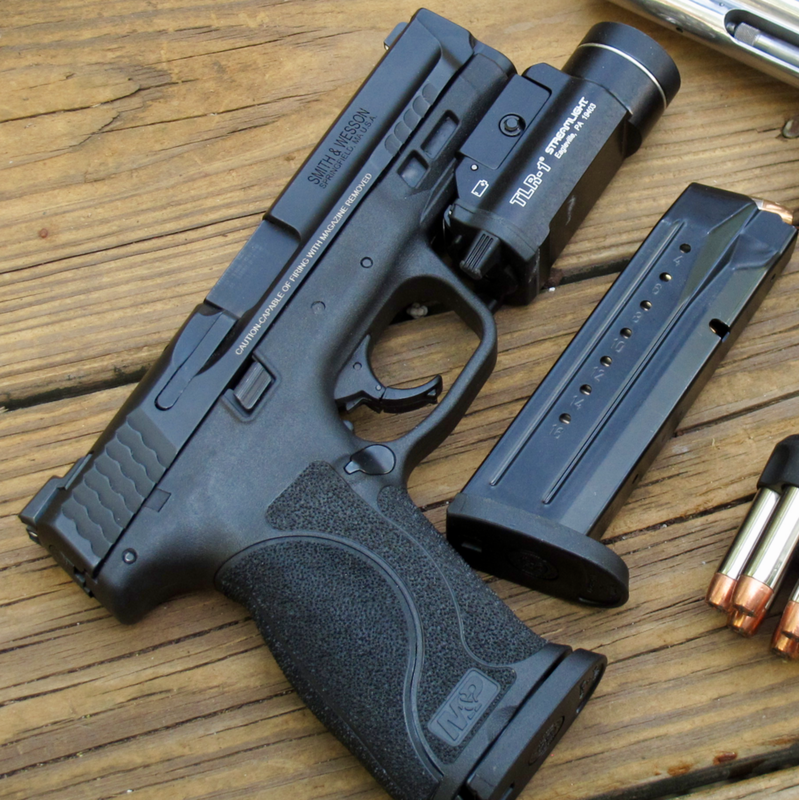 The Smith & Wesson M&P pictured below is a striker fired handgun. Revolvers: Revolvers have a cylindrical magazine that holds all the ammunition. Revolvers can further be broken down into single action or double action. The revolver pictured below lacks a single action capability and is considered double action only (DAO). Is the gun for self-defense? If yes, is it intended to be carried, or simply remain in the home? Will it be used for other purposes? What are your levels of skill and dedication to training? The R.E.A.P. test is a set of standards that will help you select a handgun, especially for defensive purposes. R.E.A.P. stands for Reliability, Ergonomics, Accuracy, and Power. Reliability: First and foremost, a defensive handgun should be reliable. If the gun constantly malfunctions it is not going to serve you well, and you should consider something else. Mike’s recommendation for assessing reliability is being able to fire 1,000 through the gun without any malfunctions. Mike also recommends setting a goal of firing 200 rounds of your defensive ammunition through the gun, as well. Ergonomics: The gun should “fit” you. You should be able to manipulate all the controls on the gun. If you intend to carry the gun it should be size/weight appropriate, and you should be able to conceal it with a high quality holster. Though similar in size and exactly the same in caliber, each of these guns exhibit very different ergonomic factors. Accuracy: Almost all of today’s handguns are more accurate than the people shooting them. However, some people will be able to shoot certain handguns better than others. The gun should be one that YOU can shoot accurately. A good example of this is a the compact revolver. Though it is probably reliable and has decent ergonomics, the light weight and long, heavy trigger make it difficult for many people to shoot well. A number of factors may influence accuracy. If you can’t reach the trigger properly you may not be able to shoot the gun accurately. The sights on the gun may affect your ability to shoot it accurately. The Dot Torture drill is an excellent test of accuracy. If you can shoot this drill “clean” the handgun works well for you. Power: A handgun should have sufficient power for your intended purpose. If you are hunting large game with a handgun you will probably need a different handgun (and ammunition) than one intended to defend you against human aggressors. There are a TON of debates about which caliber is best, but Mike, Rich, and Justin all carry 9mm handguns. Many handguns are more “powerful” than 9mm but they have a ton of downsides. Most shooters can’t manage recoil on a .45 or 10mm as well as they can a 9mm. Over extended periods the 9mm is also easier on your body, allowing you to practice more. Ammunition for the 9mm is also very inexpensive relative to other defensive calibers. Familiarity: each gun will have similar controls and feel the same. The manual of arms (the steps taken to operate the gun) will be the same. Equipment Interchangeability: If you have a couple 9mm M&Ps, they will probably share magazines. This reduces cost because magazines for one will probably work for the other (in at least some cases). Holsters may also be interchangeable for guns from the same family. 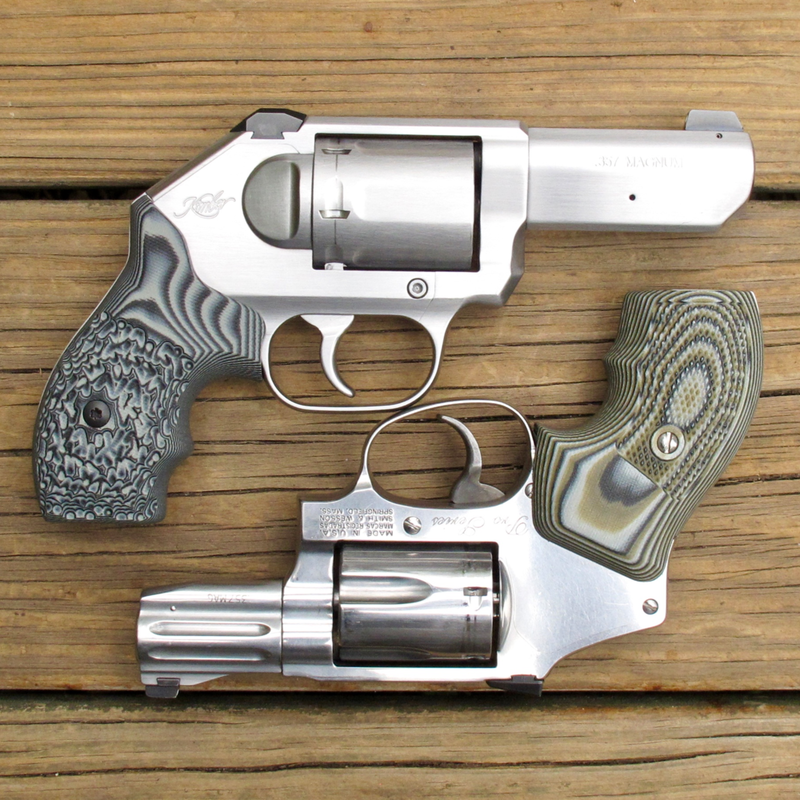 Two excellent .357 Magnum revolvers: the 3” Kimber K6S (top) and the Smith & Wesson 640 Pro Series. Revolvers also have some HUGE disadvantages. They are difficult to shoot well, especially when compared with similar-sized 9mm semi-autos. Recoil, especially in small revolvers, can be punishing. If you want more information on revolvers, check out Justin’s dedicated revolver blog RevolverGuy.com. You will also need some other things to keep your gun running. Magazines: If you are brand new to firearms, we generally recommend you stick to factory (OEM) magazines from your gun’s manufacturer. You should also have a few extra. Sights: Some manufacturers put excellent sights on their guns. Others install substandard plastic sights that should be replaced. There are a myriad of sighting options including fiber optic sights and glow-in-the-dark night sights. Lights and Lasers: You can install flashlights and laser sights on most modern semi-auto handguns. Weapon-Mounted Lights: These provide a tremendous benefit in low-light conditions. You can illuminate the area while keeping both hands on the gun. Excellent examples of weapon-mounted lights are the Streamlight TLR-1, the Surefire X300, and those made by Inforce. Some weapon-mounted lights have a built-in laser sight, as well. Weapon-Mounted Lasers: A laser will project a dot on to the target. This can help you aim much more quickly and can be a massive benefit during periods of low light. Crimson Trace makes excellent laser products for a huge range of firearms. Belt: This doesn’t seem like it would go in an episode about firearms, but the belt is the basis of your EDC system. If you intend to carry a gun, you should have a high-quality belt. Both Mike and Rich LOVE the nylon tactical belt from Precision Holsters. Holsters: Even if you don’t intend to carry your firearm on a daily basis, you probably still need a holster. If you do decide to carry a firearm on a regular basis, you will have to do some research to find the right holster for you. You may end up buying two or three holsters before you find one that fits. Both Rich and Justin carry their daily-carry guns in holsters made by Precision Holsters (you can get 10% off by using offer code “seekAWS”. Justin has also had excellent results with holsters from Dark Star Gear. Ammunition: You will certainly need some ammunition. 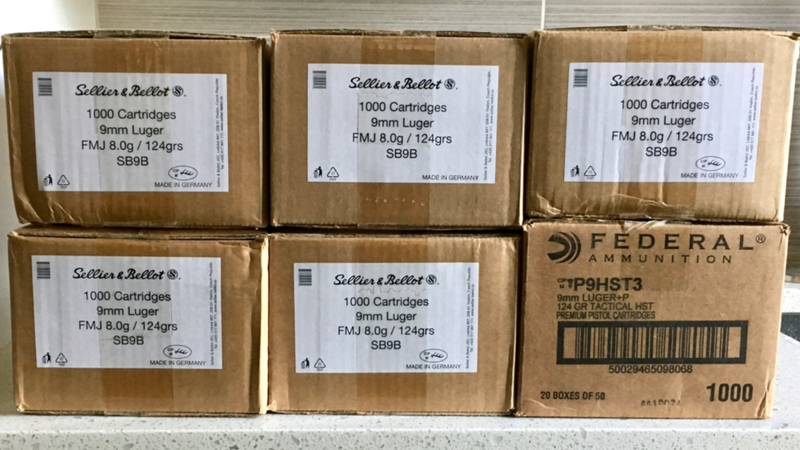 You can save a massive amount of money by purchasing ammunition in bulk. Justin buys most of his ammunition from SGAmmo.com. Magazine Pouches: You will probably also want to have a magazine pouch for use on the range. Cleaning Kit: Your firearm will need to be cleaned. Having a quality cleaning kit will make this an easier and more efficient process. Eye and Ear Protection: This is absolutely non-negotiable. If you are going to fire your firearm at all, you MUST have eye and ear protection. Eye protection should be Z-87 rated. Ear protection runs the gamut from in-ear foamies to over-the-ear muffs to electronic ear muffs that amplify normal sounds but dampen gun fire. Affiliate Disclosure: Across The Peak uses Amazon Associates to earn a small commission when you click Amazon links on our site. We are also affiliates with Private Internet Access, and receive a small commission when you subscribe. This helps to support the blog and the show.